To me, all yeast doughs are "magical," but there's no real magic to sourdough. Just wild yeast and lactobacilli doing their thing in their own sweet time, it's more art than science on the baker's part. As they say, it isn't rocket surgery! I've received so many questions about sourdough that I thought it was time to write another post about it. Time to dispel the myths! Really, nearly everything I've ever read on the subject makes it seem way more complicated than it is. If you are an experienced sourdough bread baker, you might be having wonderful success with entirely different methods than mine. If so, just keep on doing what you're doing. But if you're new to sourdough bread (true sourdough bread made with a wild yeast starter and no added commercial yeast), this post might be just what you need. 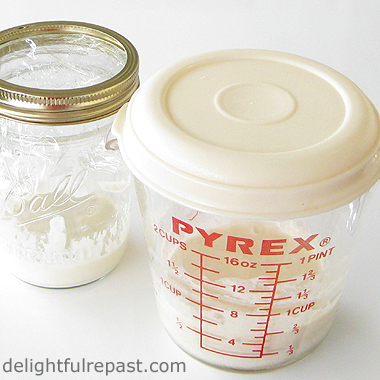 First of all, here's How to Make Your Own Sourdough Starter. And it doesn't require you to invest in a fancy crock or imported flour. You don't have to wait until grapes are in season or until you remember to pick up some distilled water. You don't have to wait until you buy a digital kitchen scale (though it is a wonderful thing to have for many things). People sending me questions have quoted experts who give extremely precise directions for making a starter. And you don't have to discard huge amounts of your starter. People sending me questions have pointed me to experts who would have them regularly discarding starter--both while they're starting the starter and when they're using the starter. Now then, after a week or two, you have a nice bubbly starter. How do you keep it going? Do you have to get a babysitter for it when you go on vacation? Since I like to bake sourdough bread twice a week, I could probably just leave my starter on the counter; but I keep it in the refrigerator. 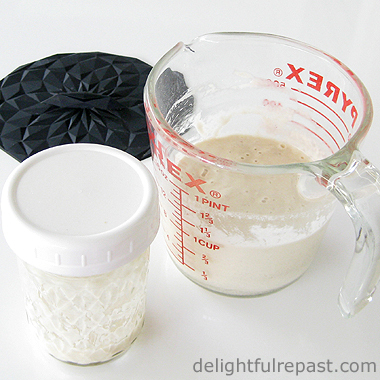 If I'm not baking bread for a while, I have had the habit of taking it out and feeding it once a week as mentioned in my How to Make Your Own Sourdough Starter post. But guess what? Once every three weeks would be good, but we had an incredibly long spell of heat and humidity that killed my interest in anything to do with the oven. And I totally ignored my little half-pint jar of starter for months as it gradually migrated to a back corner of the refrigerator. When I finally revived myself and remembered the starter, I was sure it would be past reviving. Sure, it had separated into a couple layers and looked a little down on its luck, but I thought I should at least give it a try before I tossed it and started over. Hey, if I could be revived, anything could! I just took out a couple teaspoons of it and put it into a 2-cup glass measure and started feeding it. When I'm baking regularly, it just takes two feedings; but I fed this next-to-dead starter twice a day for a few days (small amounts, with NO discarding) until it was bubbly. I should also mention that the two sample schedules in that post are just samples. You don't have to be that structured. Most days, I do first feeding in the morning, second feeding in the evening, stir up the dough in the morning, let it rise until doubled (which can vary, but right now is about 6 hours), then shape the loaf, left it rise until doubled (which can vary, but right now is about 3 hours) and bake. You'll find your own rhythm! So I guess the moral of the story is: Just do it! Sourdough seems to have a mystique about it that some might enjoy but that holds people back from giving it a try. Don't be discouraged if your first bakes aren't completely successful. It takes a while to know your starter and your dough. Just do it! And let me know if you have any questions. 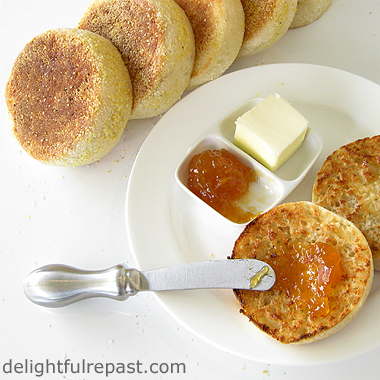 PS Here's my recipe for Sourdough English Muffins. Well, I’m all for anticipation, but this much prep is a little like inseminating a cow to get a hamburger sometime in the future. I mean, no, no, I’M not inseminating the cow…um, haha – let’s just skip that example. I got as far as the digital scale, but then I stood on it, and now there are springs everywhere. You got a recipe for broiled springs? Spring(s) rolls maybe? Ah, ptooie, I’ve blown this comment already. Anyway, I’m mightily impressed with all the preparation, and like I say, anticipation is half the fun, but I think I’ll opt for a nice breadless PBJ sandwich… Pass the napkins, please. :D Ha! Thanks for the comparison to animal husbandry (and the clarification about your role, or lack thereof, in it) -- just the sort of myth I'm trying to bust! Don't be scared, Sue! I'm here for you! I'm so fond of every kind of bread, I'd love to live with bread and chocolate, it could be enough for me ! Can you imagine how I appreciate this recipe of yours, my dearest Jeanie ?!? Thank you, Dany! For my tea this afternoon, I'll have a perfectly toasted slice of it with marmalade and a small pot of Earl Grey tea. Hugs to you! I can envision you there in the kitchen with your apron and the smell of bread in the room! So glad you shared another award winning recipe with us! Oh, Bernideen, you just painted one of my all-time favorite scenes! Is there a better smell in the whole world than baking bread? I think not! Jean, wonderful! Everyone in my house adores a lovely crusty sourdough...I will be saving this, especially for winter months when we enjoy lots of homemade soups! thank you for sharing! Thanks, PP! Yes, soup and bread, that's all you need! Greg, thank you! I just want everybody to be able to have good bread any time. Never dump those extra starter...always use them in making sandwich loaf with a little bit of yeast..thanks for sharing, Jean! Angie, I'm going to share some your site with some of my non-wheat friends. They'll really appreciate the tremendous array of different grains you use. Thank you, Elaine! So many people make more work of maintaining a sourdough starter than of keeping a pet! Loved this post, Jean! I do think people fuss over the details instead of 'just doing it' and letting the art of sour dough emerge to pleasantly surprise you! I loved the cadence of your writing with 'not necessary!' punctuating your points. And I loved how you lovingly acquiesced the shape of the loaf to Mr Delightful's preference! As always your photos are most inviting! All in all, simply delightful! Sue, thanks so much! Only you would notice these things! Wasn't sure about the "not necessary" lines, but wanted to try something a little different. When we first started to visit San Francisco about ten years ago, I really didn't like sourdough bread but it really has grown on me and now I love it! I've never made my own though, although I have thought about it. Your post makes it sound much more do-able, Jean, and I'm relieved it's not as complicated as some of the folks out there would have us believe! Thank you so much for sharing this post with us at the Hearth and Soul Hop. Pinned and will share. April, thank you. And thank you for sharing the post. I really want to encourage people to try it. Rue, I'm so glad. I hope you'll try it soon and let me know how your starter comes along. I honestly need you to actually show me how to do this. I tried a recipe from a book I was given at Christmas. The author chef called his sourdough starter a ,poolish. I followed everything he wrote religiously and I ended up with a mess. I had to chuck in the bin. I had bought a bag of Allinsons strong wholemeal flour from my local TESCOS. On the back of the bag of flour was a simple bread recipe which I followed and it worked. The recipe included dried yeast but it worked. I really do not know how to use a sourdough/ poolish starter. As I said Jean, I need you to actually show me!!!!! When are you coming over?? Ha! Ha! Since my last comment, Jean, I have Googled sourdough and been reading up a little more about the subject. I think you commented, just have a go! Ok I will have a go. I think I understand a little more about the biological processes.I am apprehensive about the final use of the sourdough. How easy it to combine the sourdough with flour to make an actual loaf of bread? That is the part where I went wrong with Jean Michel Raynauds methods in his book of beautifully photographed recipes set in moody French rustic interiors. Tony, I'd love to go over and show you how it's done! Maybe get a group together and pay for my travel expenses?! :-) Anyway ... I give very explicit directions in the links within this post. Just click on How to Make Your Own Sourdough Starter, Sourdough Artisan Bread, Sourdough Sandwich Bread, Sourdough English Muffins. David, thank you. Reading while a loaf of bread is in the oven. Sounds wonderful. Hope you have a cup of tea in hand as well! "Maybe get a group together and pay for my travel expenses?! " I wish I could. Do you make YOU TUBE clips? It might be something you could have a go at. Karen, that's great! I hope you'll start a starter soon! Let me know if you have any questions along the way. Hello, homemade bread is the best. I love sourdough too. Thanks for sharing your tips and recipe. Happy Monday, enjoy your new week! Thanks, Eileen. I shaped a sandwich loaf at 5:30 this morning! So should be having a slice by teatime this afternoon. Hope you have a wonderful week, too. I greatly appreciate you sharing your wonderful posts with Roses of Inspiration. Have a lovely week! Hugs! Quite all right, Stephanie. Thanks for the visit! I know you'd love a slice of this bread, toasted, with butter and jam along with a nice cup of tea. Hi Jean, what a lovely sounding recipe. We both love sour dough in this house but I have never had the courage to make it. I will make a note of the addy and be brave for once. I have company coming next month and this would make a wonderful bread to serve up. Thanks for stopping by my Today's Flowers meme, and if you ever take a picture of a flower, I would love for you to share it on my meme. But honestly, I am very happy you stop by and leave such a nice comment. Thank you so much and have a great week. I used to make sourdough bread decades ago and I'm not sure why I stopped. I might have to start making bread again. It's great fun, Carol, and the perfect activity on a cold or rainy day. Very useful tips, you know I love sourdough bread and it is my weakness, thanks for sharing with Hearth and soul blog hop, pinning and tweeting. Thanks so much, sweet Swathi! Much appreciated, as always. I've never made a yeast bread, only quick breads and my favourite Irish soda bread. You sure make it look easy Jean and I've tried other recipes of yours so perhaps I'll jump in and give this a try one day. Judith, I hope you will. I think you'd really have fun with it. But I do love Irish soda bread, too. I LOVE SOURDOUGH! I have never had a chance however, to nurse a starter and develop a really homemade bread. Pizza dough was once my specialty, but a busy job called me out of the kitchen! I love sourdough...great tips. Thanks for adding this to the Thursday Favorite Things Blog Hop! Anita, even with a busy job, you have time for sourdough -- IF you do it MY way! :-) Really, I make it when there is no time, when I'm sick, in my sleep ... Thanks for the camera info. Su, thank you! 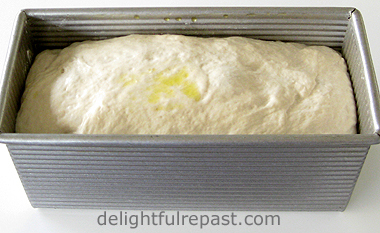 To me, there's nothing prettier than a loaf of bread (I'm a breadaholic!). I love sourdough and I can almost smell it baking! YUM! Thanks for the wonderful tips and thanks for sharing with SYC. Thanks, Jann! And thanks for hosting! 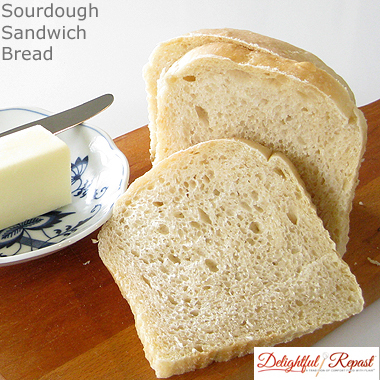 Great tips for the Sour Dough, which I love! Looking forward to seeing you again at Full Plate Thursday tonight! Thanks, Miz Helen! I do love a Full Plate! Thanks, bj! Bread is number one for me! 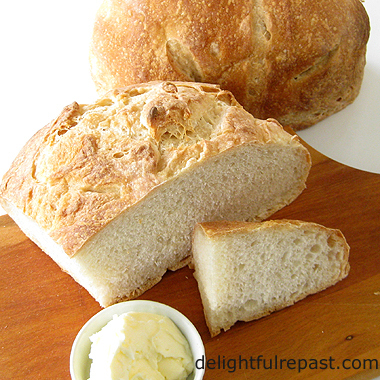 This sourdough bread looks delicious.Homemade bread is always wonderful.Stumbling to share.